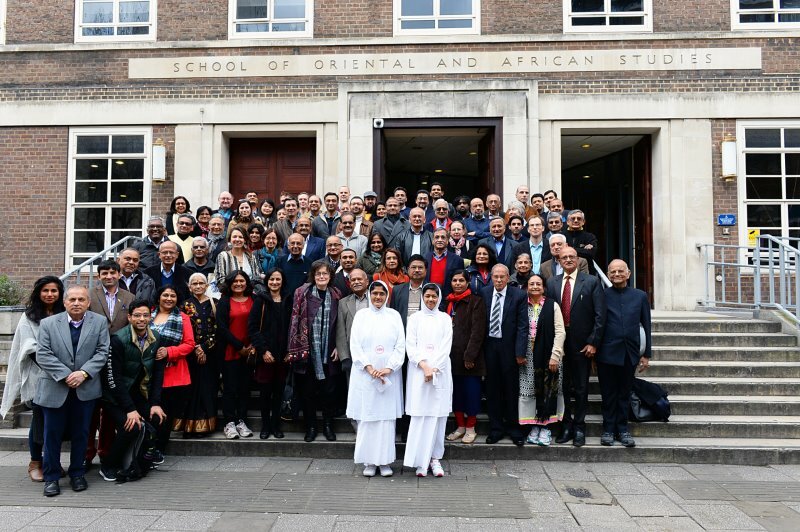 The Centre for Jaina Studies at SOAS is well-established and has hosted a number of annual conferences – 18 in total so far, and the latest one has just finished. Dr. Peter Flugel is Director of the Centre and it was held jointly in partnership with Gyan Sagar Science Foundation in India. Here is a link to the full programme and itinerary and the diverse speakers. The perspectives covered included Jain Mathematics, Jain Physics, Jain Epistemology, Jain Metaphysics and Karma/Consciousness. At the end, there was also a panel discussion on the extent to which Jainism is compatible with modern science. There are a number of Jain biologists, medical scientists, and neurologists but sadly these topics were not covered as they did not submit a paper or attend. They are also an important dimension of Jain Science. As always, the scholars present commented positively on the strength of having the living community present at the event and engaging in dialogue. Not only are we a profound philosophy, but we are a living philosophy and culture, and that really adds to scientific dialogue and experience. Having attended many scientific conferences in my time, I find that they can often be dry and abstract, removed from the real world and lived experience. I found it an important conference on a topical event, with many new dimensions and exposes. Full credit to the sponsors and the hosts. The aim of this blog is not to report the conference in detail, but to share my reflections on the proceedings and dialogues. As a social scientist and a Jain, I would like to pen some observations and reflections on the event and suggestions for future similar dialogues. Jains have a rich tradition of research and enquiry in a range of areas which we would call science today. Most of this work was not done in a laboratory or a University, but often by monks and nuns through personal effort and study, or by intelligent lay people. The values that inspired this work were often selfless and non-material. For a long time, research in the Jain tradition was not institutionalised like it is in modern Universities, where there are courses, professors, and established norms of measuring scientific progress and even validity and quality. This has advantages and disadvantages too, but context is important to the output of research. Modern western science has deep ontological and philosophical differences with Jain Dharma. It is not holistic, very materialistic, and latterly hugely positivistic. Rather than having an interest in creating a better more peaceful and compassionate world, its concern is with objective truth and methodical analysis as if these were abstract from value judgements. Jain science is fundamentally value-based and places ethics at its centre, not periphery. It also sees truth very differently. Here is an excellent TED video which explains what I mean by ontological difference. Inter-cultural communication of any kind is problematic. We know from our personal experiences – e.g. basic ideas like family, community, food, festivals, language are all so different, especially between India and the West. Even religion is a wrong translation for Dharma – Dharma is at heart a science of sustainable living, and all too often, Jain Dharma gets misclassified as a religion, which is perceived very differently in the West. At this conference, I could see the problems such communication created. Often scientists are not very good at clarifying their assumptions and biases up front, and this leads to misunderstanding and misinterpretation. Scientific power today lies in the Western World, with its vast Universities and research funds and establishments. As a result, they often dictate what science is and how it is to be done, and therefore what is not science, and how it shouldn’t be done. As Jains, we need to be very careful about the complications and limits of such dialogue, and not try hard to ‘prove’ ourselves in the language and baggage of western science. In my opinion, many of our perspectives are far ahead and beyond these institutionalised and secular boundaries. Rajiv Malhotra has argued that South Asian Studies often undermine India, so we need to be very careful about our loyalties and support. Scholars in different disciplines also have their particular biases. Thinking is often in silos rather than holistic and inclusive. Indologists I find are a particular breed, and have their own way of doing and discussing science, which tries to be dispassionate and ‘objective’ whatever that means. It is also often very positivistic. Even basic aspects like how we see Dharma as a holistic science and way of living is not understood or accepted by all. This is a fundamental controversy and makes a huge difference to the science they study and research. They also often actively deny having faith in Jain dharma, as if to even embrace some of it would damage their objectivity. In truth, many scholars of religion in western universities come from a deep faith background. It is well-known that the whole field of Oriental and South Asian Studies was established to help the West spy and also conquer and rule this continent. As Jains, we need to be aware of this history and be careful in our sponsorships of research projects and dialogues. One of the fundamental flaws with western science is its dualistic world-view – that the observer is separate from that which is observed. Symbolic knowledge is often used as if it were concrete reality – what Whitehead called the ‘fallacy of misplaced concreteness’. As I understand it, Jains see truth as something which is intimate and fundamentally subjective (paravidya), depending on the perspective of the seer. We do not deny that the observer is always a part of the experiment and never completely separate from it. This sense of intimacy I could observe in some of the speakers and papers, and for me made a difference to the science that was presented and shared. Our own Jain ontology is very different, and our science of consciousness has huge implications for the meaning of truth and wisdom, which modern science is far from even beginning to understand. We are streets ahead in this arena, but this is not recognised by western scholars or scientists. The Heisenberg Uncertainty Principle and the Incompleteness Theorem come close to showing the huge flaws and challenges of the physical sciences. If truth is fundamentally subjective, then there is a huge problem with codifying it and universalising it. It cannot be turned into an instrument for profit or exploitation, for conquering and controlling nature, even undermining its essence and purity. Most scientific knowledge we see today is symbolic and dualistic, but presented as universal and objective. The institutional politics and bias behind the creation of these truth claims are often hidden from view, but are very real. The ethics of science and scientists are matters of huge public concern, but they are rarely opened for public debate and critique. Experts are busy in defining their own notions of expertise and controlling and policing this territory. The philosopher Feyerabend was deeply critical of the idea of a universal scientific method, and the privileged status of science in modern society. He even said that there is no justification for valuing scientific claims above claims made by religions – something which is a given in the modern post-enlightenment world. He argues that science is ideology, and scientific theorising glorifies generalities at the cost of making life meaningful. Jain Dharma is fundamentally about compassion for all living beings, and places ethics at its centre not periphery. Scholars who research our community are welcome, and it is good for us also to directly support and engage with that research and help them with our contacts and lived experiences. It is very very hard to study Jain Dharma if someone is from outside the community – they have to learn many languages, get funding for their travels to India, and also support for their enquiry through dialogues with experts and community members. I feel all cultures belong to the living community, and it would be very good if we could take pride in that belonging and encourage research and teaching in Universities. The work of the International Summer School for Jain Studies in this area is very pioneering, and worthy of everyone’s full-hearted support. We must also support and encourage scholars from our own community, working in any field, to uphold our Dharmic values and help others to understand our Jain Science and Ethics. Feel free to comment on the ideas presented here in the comment section below.